Aged meat and dishes merging surf and turf are two of the most challenging concepts for a kitchen to pull off without a hitch. Something almost always seems to go off the deep end for both. That precious half year aged chateaubriand might taste more of provocative black garlic than sensuous, relentless meat. Raise your hand if you’ve ever had a lobster and filet mignon dish where the filet is grilled as long as the lobster is steamed, and you end up wishing you just ordered twice as much lobster? Or that pork belly and scallop concoction where the poor subtle scallop is dominated by overwhelming smoky bacon notes because that’s what pork belly does to everything? For those who are weary about aged meat, surf and turf, and the state of 21st century fine dining in general, now is an ideal time to head over to Chicago’s red hot West Loop neighborhood for a visit with what must be considered one of the definitive restaurants of this generation, Blackbird. Did I mention that Blackbird opened in December of 1997 and is just as engaging now as it was on that (probably very cold being Chicago) night back in the Clinton years. Back when Michael Jordan was in the midst of his final Bulls championship season and back when the Cubs had recently won a World Series. O.k., that last remark obviously isn’t so true, but come on, you can’t write a Chicago article without mentioning the Billy Goat curse. Hey, Sammy Sosa’s record home run year with Mark McGwire still hadn’t happened yet. There is no Billy Goat or usual restaurant curse for Blackbird, extraordinarily defying the odds for restaurants to survive beyond a decade without becoming stale and irrelevant. 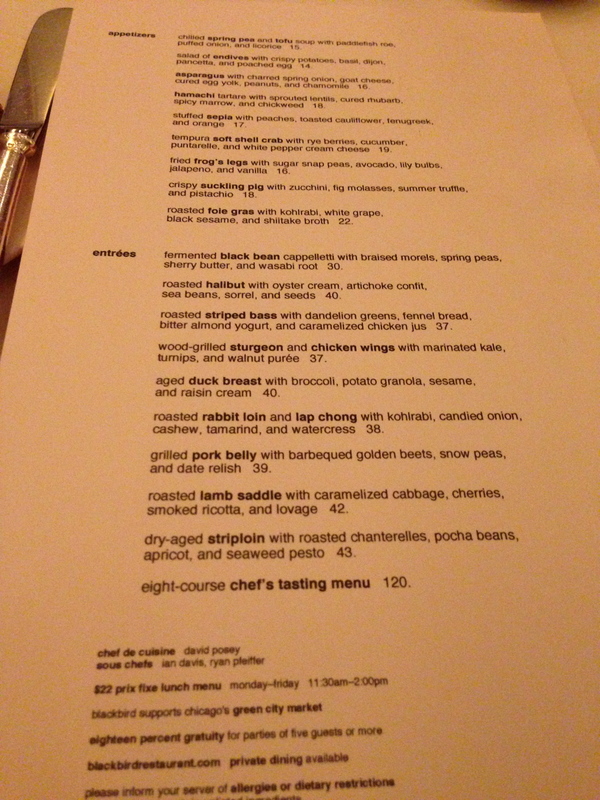 Nor is there any goat on the menu currently at Blackbird, like at a certain nearby, just as popular, but much younger neighbor on West Randolph. However, there is aged duck breast currently being served. It is majestic. There is also a handsome dry-aged striploin with the common pairing of chanterelle mushrooms, and the not- so common, seaweed pesto. Aged meat is certainly having its moment. Perhaps it has something to do with everyone’s personal quest for umami liberation, to achieve that elusive fifth taste sensation previously requiring bacon, parmesan cheese, miso, or truffle oil. We’ve gone overboard in seeking umami with far too hefty a drizzle of truffle oil on far too many pizzas. We can never go too far overboard with umami itself. Francis Lam recently wrote an excellent piece in Bon Appetit exploring this new aged meat movement. Even though its cousin Publican Quality Meats makes every type of charcuterie and butchers every cut of meat imaginable, along with dry aging meat, Blackbird’s diminutive kitchen actually ages whole ducks from beak to feet “Peking style” for roughly two weeks. That’s rapid compared to some of the aging going on around the country pointed out by Lam. Eleven Madison Park in New York ages steak upwards of 140 days and Carnevino in Las Vegas, a Mario Batali owned enterprise, ages its riversa steak for eight months. I had a similar robust aged meat experience recently with Ari Taymor’s week long aged pigeon at his restaurant Alma in Los Angeles as I did with Blackbird’s aged duck breast. Even swordfish is joining the aged fun, with the belly coated in salt and relaxing for 90 days inside a cypress box at Joshua Skenes’ San Francisco restaurant, Saison. Yes, we’re starting to talk about meat in the same terms of first growth Bordeaux. Yes, don’t you love that French oak barrel aged 1978 Berkshire pork chop? Now, aging meat is complicated, involving various temperatures and conditions best left to the experts. Blackbird’s duck preparation isn’t too complicated. The centerpiece is the breast cut into three very generous hunks, far more like a forceful steak than the usual mere medallions. The middle achieves a perfect rosy rare to medium rare, while the exterior is a crisp Miami tan with the thinnest layers of fat providing the same meat-salt pop of chicharrones. A sesame based sauce provides just the right amount of sweet and moew umami to accent the duck, without coating it. Tender broccoli lays alongside the meat, coated in a fascinating textural contrast of potato granola and raisins. There is a creative vision on display here. The crunch meets the fruit meets the spice meets the meat. In the end, it’s about that meat. The duck has an astonishing depth. Duck’s usual gaminess is easily recognizable here and yet every edge is so smoothed out, while the power of the meat is amplified exponentially. I could say maybe I tasted some hints of dark cacao or notes of alba truffles. Really, this is just the most duck tasting duck I know of. 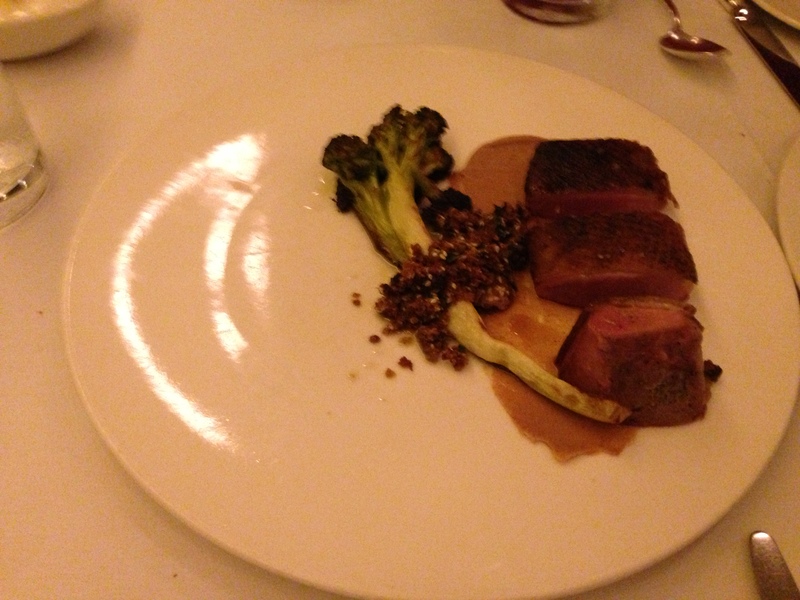 The aged duck breast may not be on the menu when you get to Blackbird with the constantly evolving selections. I was told the one sort of “concept” always on offer is some form of wood-grilled sturgeon. Sturgeon always raises eyebrows for me, usually a very tough fish. 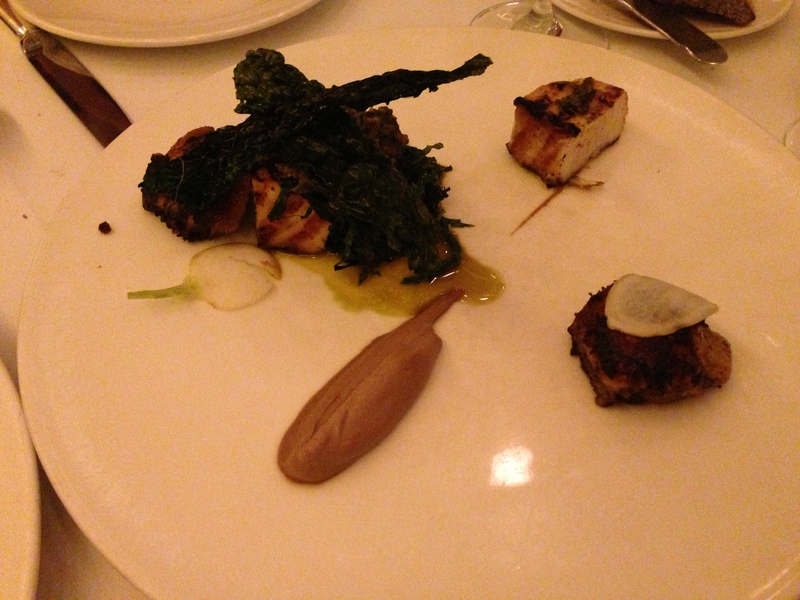 Pairing sturgeon with chicken wings set off an alarm. This surf and turf pair couldn’t have been a better match. The problem is with the similar aesthetics of both being almond brown colored and how somehow the fish takes on an earthy taste of poultry and poultry becomes as tender as a buttery Alaskan halibut. How do you tell the difference? They look the same, both with gorgeous bronze hues and healthy char marks. The meat looks exactly like it was taken from a cover of Saveur’s June BBQ Issue. No backyard Weber Grill will ever make meat or fish look like this. Marinated kale adds a terrific seafaring note, joined by razor thin slices of almost fruity turnips. The not subtle walnut purée is right on key for alternating bites between plain sturgeon or chicken, then dipping. Like how the duck tastes like exponential duck, the same can be said for the chicken wings, the sturgeon, and even the walnut purée. When something has a beautiful taste, run with its depth. Don’t look back. For nearly an entire evening, this same intensity of flavor balanced with artistic matching of accompaniments can be said for almost every offering. Now that Charlie Trotter has stepped into the retirement-graduate school arena away from the kitchen, it’s hard to really say who is the predominant chef of Chicago at the moment between Grant Achatz (Next, Alinea) and Paul Kahan. Kahan is the more likely of that pair whose cooking you will sample, unless you’re diving for the splurge and tickets of Achatz’s enterprises. By no means is Blackbird a bargain bite, but for what a meal is, everything is priced very fairly. At Kahan and One Off Hospitality’s other ventures, each unique spot ranges from the same fair, mid tier pricing to downright steals for the quality. The $13 cocktails with a sidecar at The Violet Hour are stride for stride the $20 drinks at The Office. Let’s step back for a moment and truly acknowledge Kahan’s fortitude. 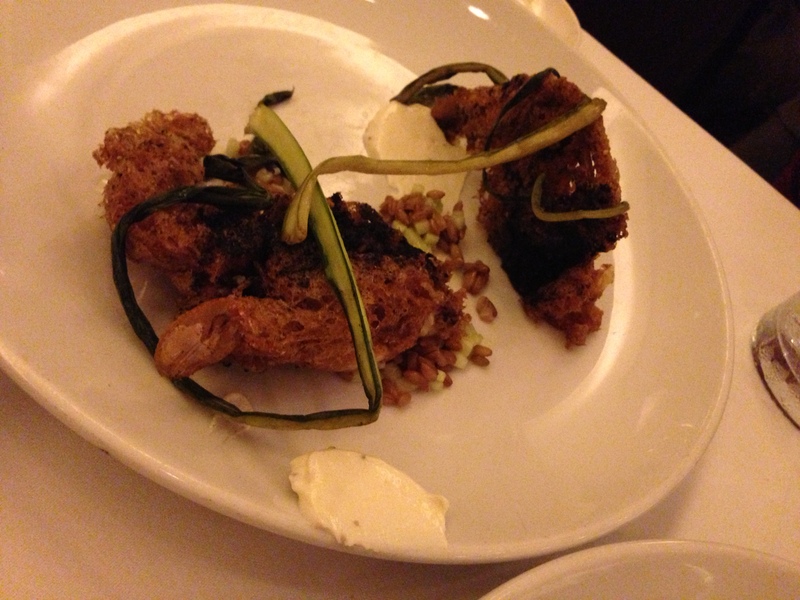 He is an immensely talented chef, though you will rarely now see him on the line at Blackbird. He is also an immensely talented business man. For anyone who has taken a few entrepreneurial classes, you know that being business minded requires both diversifying your product, having unique products, and surrounding yourself with the right supporting cast. Many chefs have gone on to diversify their products. How many times have we written about Chef A from high end restaurant’s new spruced up comfort food neighborhood bistro with the obligatory wood-fired oven? Or their new trattoria because their family heritage is from Puglia? Many chefs have even come up with unique products when diversifying the second and third establishments. Just look at Achatz with Alinea, then Next. The Batali-Bastianich group? Tom Douglas in Seattle is a prime example of this. The man almost never fails and never repeats himself while building a dynamic empire. The last part is where chefs often fall apart: not being businessmen. They stretch themselves too thin and don’t have the colleagues to keep the standards where they should be. You know probably dozens, if not hundreds of places like this where the flagship falters when the head toque moves on, the satellite establishments are nothing close to the flagship, or…oftentimes both. You need the right people running the books. You need the right people running the restaurants. This is where Kahan soars. Earlier this year Kahan shared the James Beard Award for Outstanding Chef in the country with David Chang, the outspoken polar opposite to Kahan’s down-home, quiet vibe. Maybe it’s part New York compared to Chicago, THE city versus the Second City. You’ll always see Chang’s tweets and of course his publication Lucky Peach. On the other hand, I don’t think I’ve ever heard Kahan speak ever. Both are visionaries. Both expand, but not rapidly. Chang replicates Momofuku brands now in Toronto and Sydney. Kahan is in Chicago. 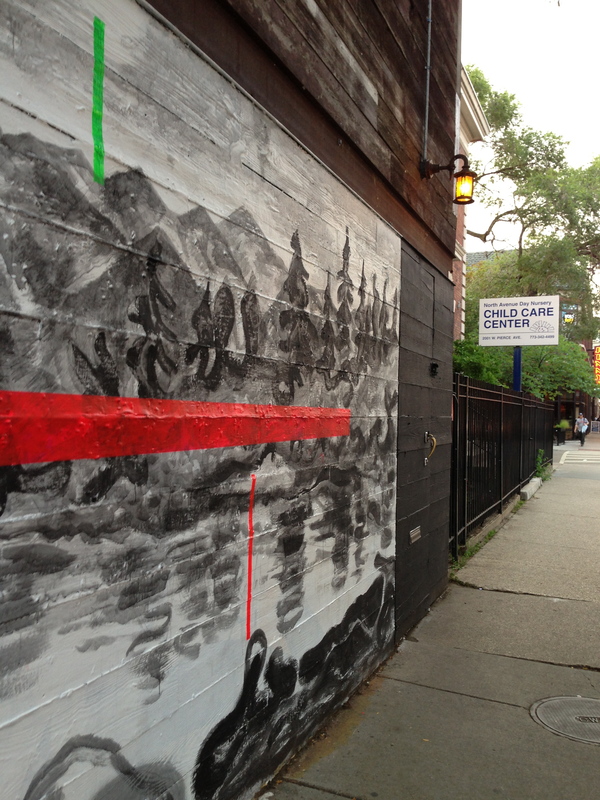 And really just two slivers of Chicago at that: Bucktown and The West Loop. His entrepreneurial sense really is something else. He has his pulse on what project really would fit neighborhoods begging for it. What was West Randolph before Blackbird and avec, Fulton Market sans Publican Quality Meats, or Bucktown without The Violet Hour’s secret door? Can you see The Violet Hour? The credit goes not just to Kahan, but his team. Business partner Donnie Madia is the restaurateur who makes One Off one of a kind. Seriously, how did the man know that a Bakersfield 1930’s-1940’s era taqueria and bar is exactly what Bucktown needed? Then add co-owner and sommelier Eduard Seitan, one of the few partners in a restaurant group you’ll find on the floor offering you a pairing with the salad of endives and crispy potatoes. 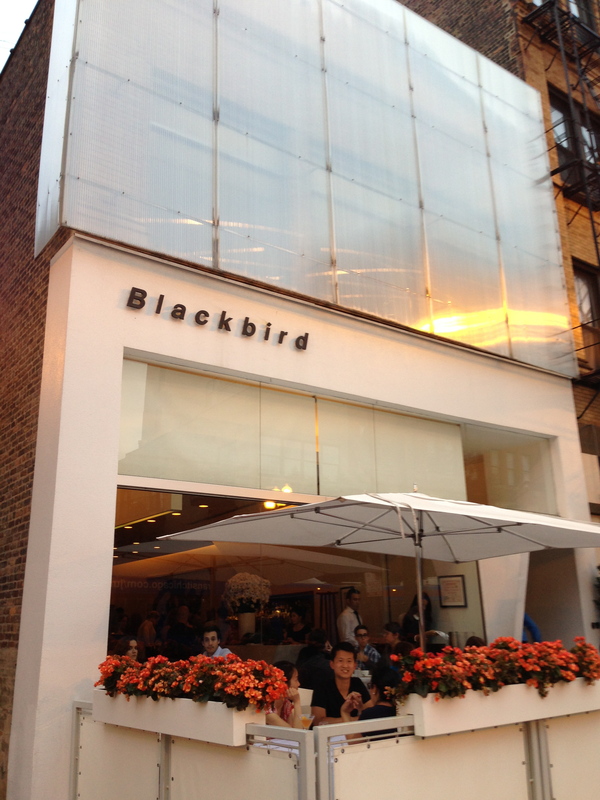 Over at Blackbird, David Posey runs the show with sous chefs Ian Davis and Ryan Pfeiffer. 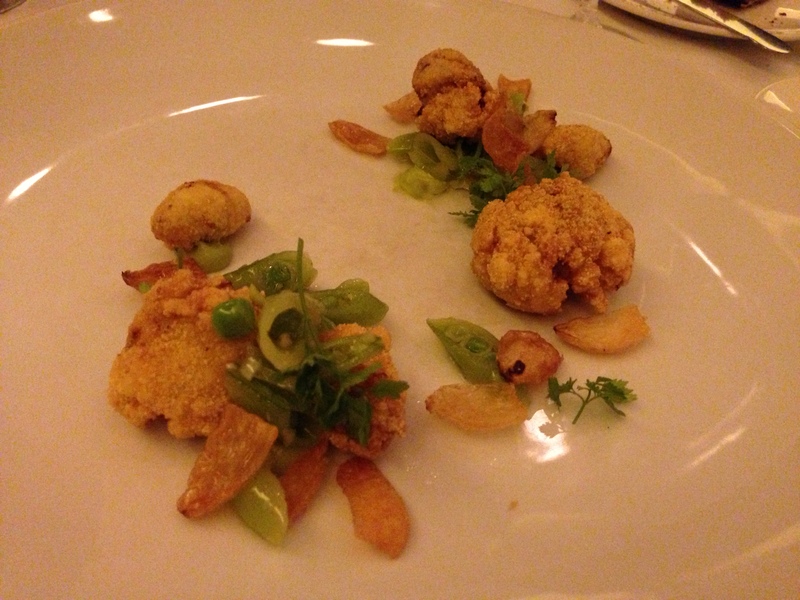 This year Posey was also nominated as a Rising Star by the James Beard Awards. 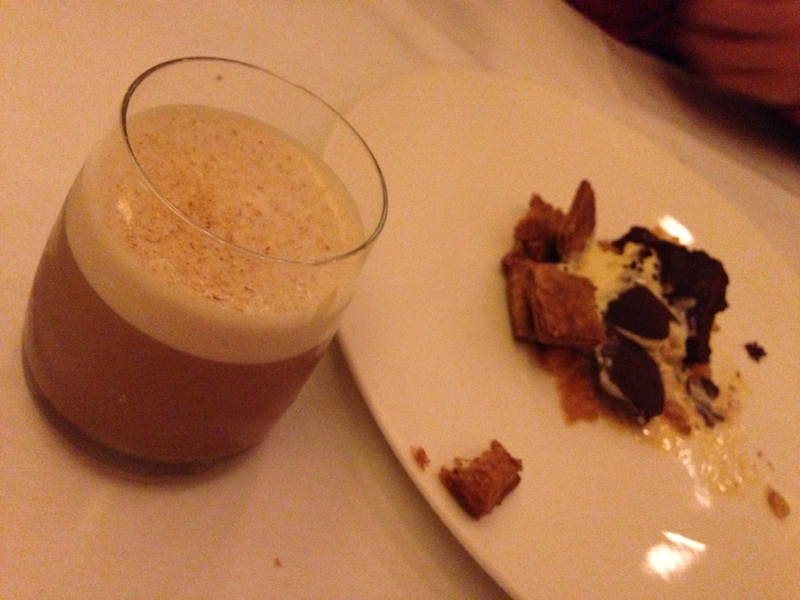 His colleague, the pastry chef Dana Cree, puts Blackbird’s desserts almost ahead of the savory dishes. She’s a prodigy, combining the best from learning under the likes of René Redzepi, Grant Achatz, Alex Stupak, and Heston Blumenthal. Talk about a resumé. Pardon me as I discuss dessert before the end of this meal. Cree‘s chocolate creation was a risky revelation, telling an enchanting narrative on the tried and true dark chocolate mousse dessert. She starts with a bittersweet dark chocolate torte, alluring on its own. Sesame emerges with honeycomb as puffed pastry and cumin powder then adds an important seductive savory element, calmed by the sweet spoonfuls of tangerine marmalade. A quenelle of more burnt honey, this time as ice cream, finishes the perfect composition. 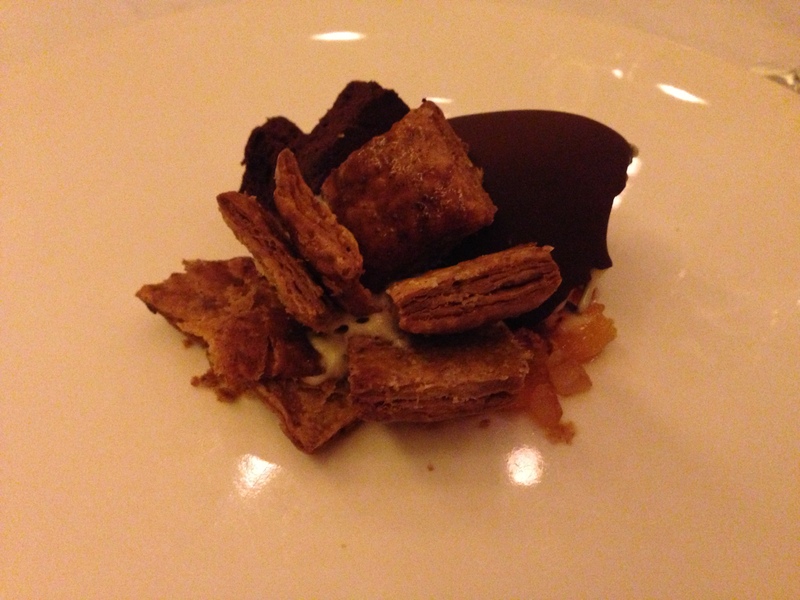 Also, a milk chocolate “fudgesicle” with caramelized apricot soup and one of Noma’s favorite ingredients, rooibos tea. Kids and adults alike can’t resist bubblegum ice cream, bubblegum mochi, and marshmallow parfait. I’d venture to guess a pastry shop just might be in the works next. Over the course of a week in town, I dined, drank, or at least tried to dine, at each of One Off‘s establishments. Each one was as unique as I had heard before and almost always excelled magnificently in their very focused niches. The Violet Hour’s cocktails, be it the exalted “Juliet and Romeo,” or a Bourbon riff on a “Penicillin” called “The Clapping Belle,” were as good as it gets. The same can be said with the consummate, dapper bartenders and waitresses in the candle lit, elegant speakeasy room. Brash, bright, party central German style beer hall The Publican is the total opposite of the quaint, enchanting Violet Hour. 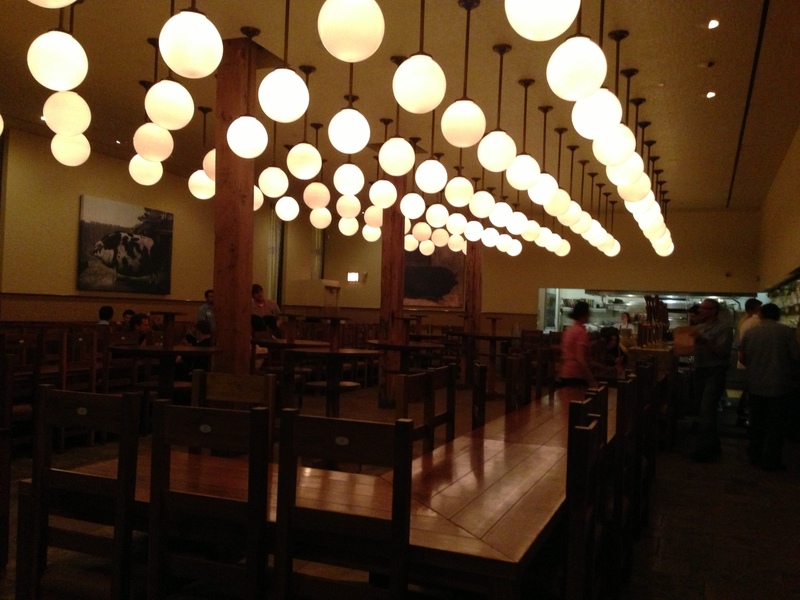 I couldn’t stand the cattle-style booths along the sides, much preferring the mile or so long communal table with a glass of Alpha King Pale Ale. Then devour the spicy pork rinds, textbook porchetta, and the smoked ham in hay. Even the best salad on the menu has pork ears. Oysters are good too and last I checked didn’t come with pig snout. 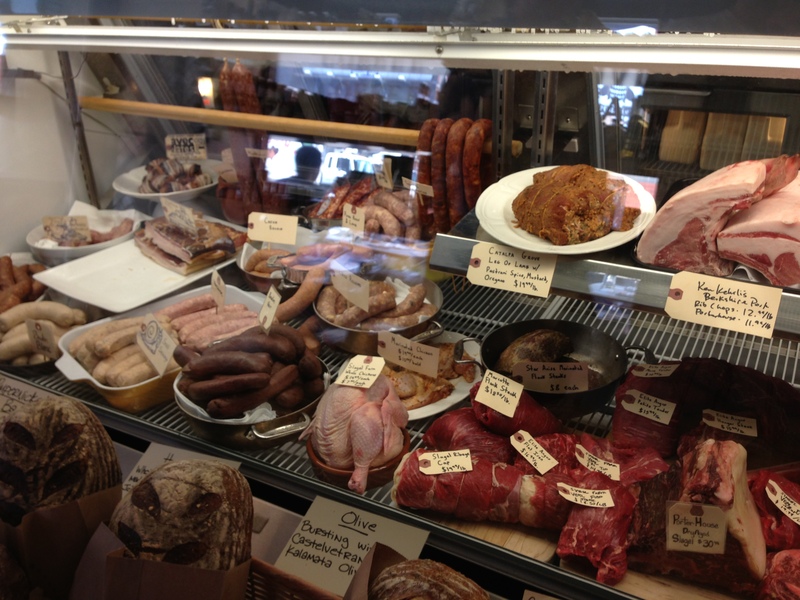 Publican Quality Meats’ butchering is the envy of butcheries worldwide. The Toulouse sausage would’ve helped a Cassoulet achieve unforeseen heights. Cheeses and excellent breads aren’t to be forgotten, nor is the Cowboy cookie, again a nod to Momofuku by being awfully similar to the Compost Cookie with dark chocolate chips, white chocolate chips, pretzel, and pecans. Outside of the meat, the sandwiches are the main mode of business it seems at PQM. “The Return of the Gyro” with braised pork belly showed the highest of sandwich making art. A truffle and tallegio sausage with fennel, apple, and snap peas was beautiful. For a classic Italian cold meats sandwich, it doesn’t get better than the “Dan’s I-talian You-talian” on a hefty French roll. .Heck, even the Tinka’s Tofu sandwich is worth a trip and I don’t think they butchered the soy bean animal. Big Star was the only fair spot I visited, most likely due to its insane crowds on a Friday night. The al pastor taco’s pork didn’t have the spectacular glaze or tenderness of the “Return of the Gyro”’s pork belly. The taco tortillas seemed a bit starchy, if even stale. A street corn style tostada had too much mayonnaise covering up the Cotija cheese and corn. Despite the crowds, service, yes again, rose above the noise and wall to wall people. And what about avec? Kahan’s second venture opened in 2003 and hasn’t been empty since. Last year Bon Appetit’s Andrew Knowlton named avec one of the country’s 20 most important restaurants, sharing the name with much flashier names like Alinea and Manresa. Avec is often given the honor of being the pioneer in establishing a communal table and a no reservations policy to evoke a casual wine bar (and the trend of all lower case names, these aren’t typos). There are no nondescript cheese and charcuterie plates to go with your tasting flights here. This is a real deal kitchen, every bit Blackbird’s. Whether being the pioneer of this informal, frustrating long waits and shouting over neighbors style of dining is a positive honor is up for debate. For those of who prefer knowing where we’re dining or not, and prefer not hearing the dreaded news of “an hour long wait, so go order drinks at the bar,” you can guess our opinion. 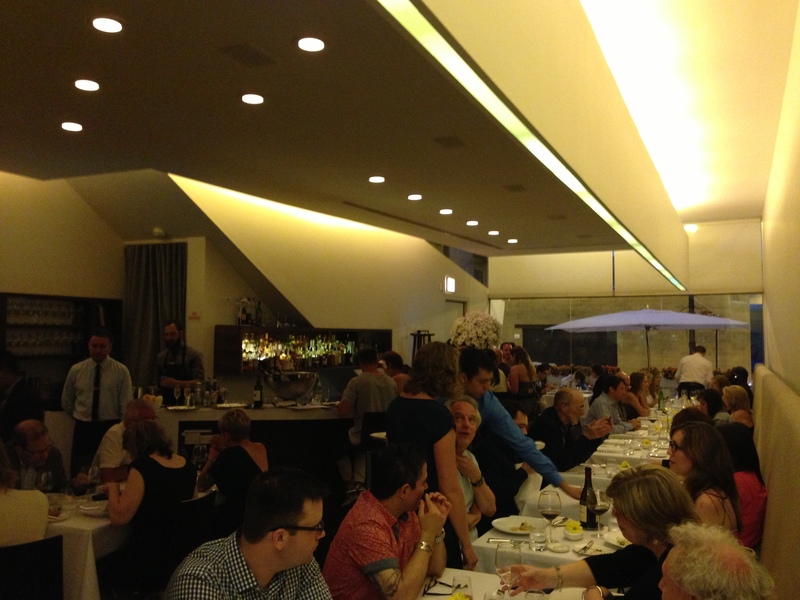 We showed up at avec at prime time 8pm on a Saturday night. Foolish me. I don’t remember the exact estimated wait time, but it was somewhere around the length of a baseball game. On to the next stop. No wait there, but then again, it didn’t reach the heights I’m guessing avec would have. Avec’s bacon wrapped dates might be One Off’s most fabled dish. Many of Chef Posey’s would have similar cult followings too if the menu didn’t always change. Foie gras is back in Chicago (lucky!) and charming with wispy razor thin kohlrabi coins, equally thin slivered dime-sized white grapes, black sesame seeds, and a pool of shiitake broth you’ll drink to the last drop. In Art Institute vocabulary, foie gras usually is a tried and true Seurat, but this dish is a Gauguin from a faraway island. Posey again looks to France with a textbook lightly fried frog’s leg, given a soft edge from vanilla, avocado, and jalapeno. No, it doesn’t taste like chicken. Instead it’s more a quail meets scallops. Yum, right? It is outstanding. What a fresh and tidy dish without being one bit boring. Every preparation starts innocently, then gets three to four elements you’d never imagine. Sepia is stuffed with peaches and hamachi tartare is joined by sprouted lentils, cured rhubarb, and spicy bone marrow meat. One seafaring entrée combines roasted halibut, oyster cream, sea beans, sorrel, and artichoke confit. Possibly the most exotic dish sounds is a duo of rabbit loin and lap chong, accented by candied onion, cashew, and tamarind. I must admit, not everything received a standing ovation. Just, almost everything. Crispy suckling pig belonged more at The Publican, too heavy and one note. Its fig molasses, zucchini, summer truffle, and pistachio teammates could barely be heard. The meat itself wasn’t as formidable in flavor or soft in texture as you’d hope. Tempura soft shell crab had a wonderful batter like the frog leg’s, yet very little to notice beyond the batter. A few smears of white pepper cream cheese seemed more haphazard than polished. 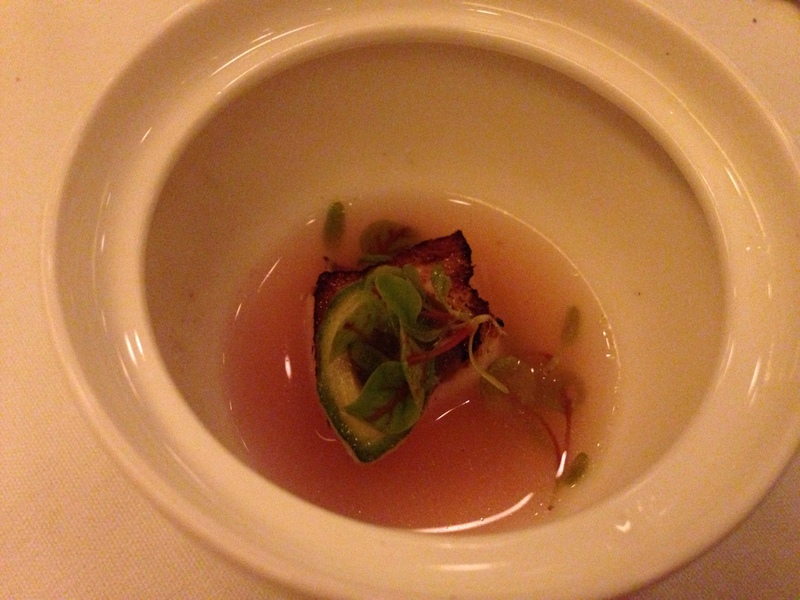 The amuse-bouche of cooked Kona kampachi was harmless, not exactly a palate exciting single bite. You’d expect it more as an entrée. 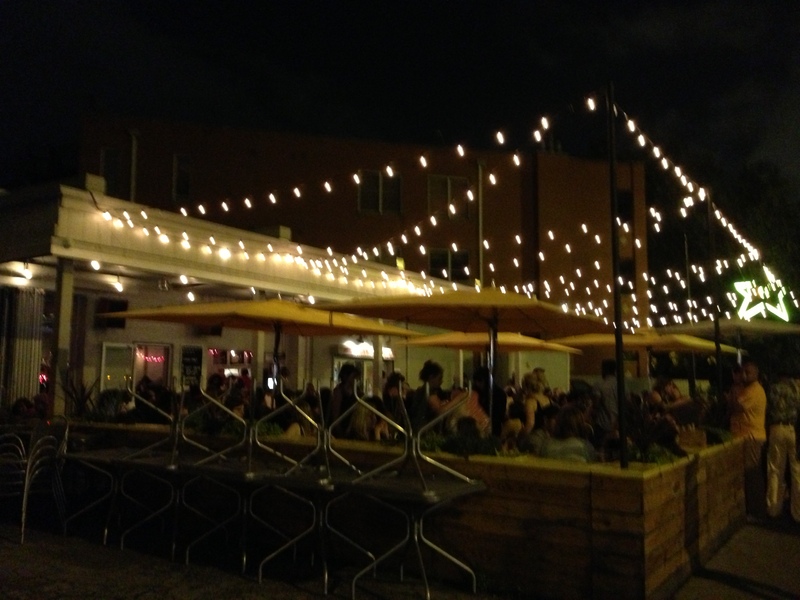 No matter what you’re eating at Blackbird, the setting will be one of the highlights. The room achieves that tricky balance of being incredibly minimalist, yet handsome and comfortable enough to not strike you as minimalist. The exterior cream colored façade will remind you of a transplanted a chic designer shop downtown, a lot like how in Mexico City or Santiago, Chile, the finest restaurants appear in random residential streets out of nowhere. A patio sits up front, with a bar on one side of the room, and an urban chic, plain white gallery- like feel exuding everywhere in the James Beard award winning design by Thomas Schlesser Architects. Yes, there is one painting in the rear. Plus a secret one in the men’s restroom, rated R. The room can seem harsh at first, but the warmth of the staff and the open kitchen defeats any chilly feelings. You’ll find some cocktail gems at the bar. Consider the Blackbird Manhattan or “Smoke on the Sour,” essentially a Bourbon version of a Pisco Sour. The wine list leans heavily on French classics, with a shocking amount of quality, hard to find California and Oregon wines. No obscure Jura grapes here, or Argentina, or New Zealand, or any of those up and coming new destinations so beloved by young sommeliers today. Do seek out the Tres Sabores 2009 Zinfandel and the 2008 Shea Chardonnay. Prices are pleasantly not marked up too steep. And no, Blackbird is not named for Kahan’s favorite bird or Beatles song. It’s the French slang term for “Merlot.” You don’t want to drink Blackbird. A lot has changed in Chicago since 1997. Alas, there isn’t even a Daley in City Hall these days if you can believe that. The Cubs are still the loveable losers, though even before Blackbird was born, we had never heard the words “Steve Bartman.” Now that seems like centuries ago. Here you have a restaurant fulfilling its vaunted reputation in the never-ending hype and competition of the restaurant industry. Blackbird’s reputation isn’t one of impeccable formality or dramatic test tubes, and preparations looking like stained glass windows. 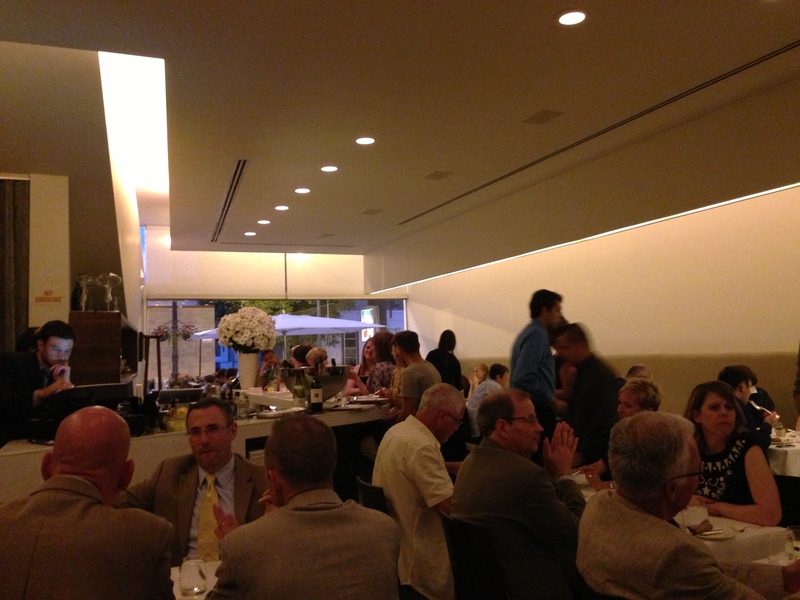 Blackbird is where you want to go for a special dinner. Kahan and the One Off group have shown us just how their creative minds know the pulse of just what their audience wants. Chicago is lucky. The shimmering white space on West Randolph is fluttering its wings as strongly as ever now. It’s the role model for an increasingly endangered restaurant species. 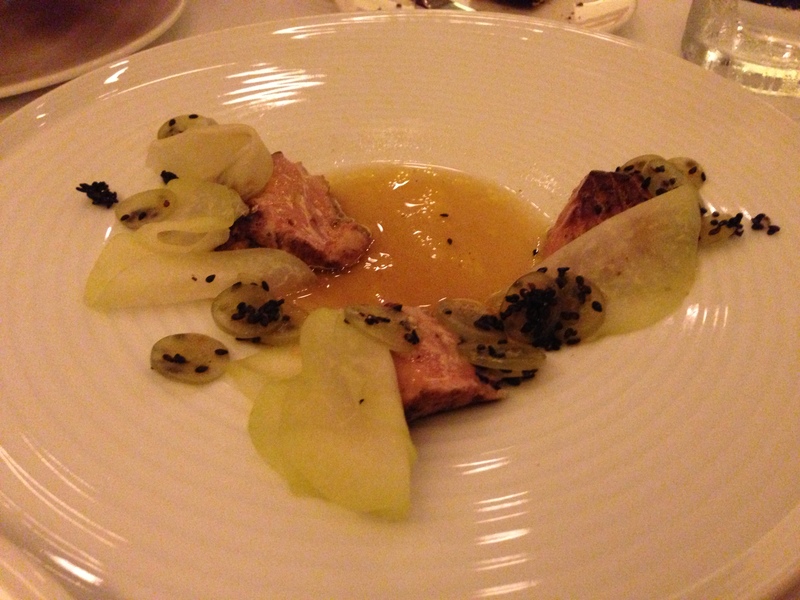 This entry was posted on July 26, 2013 by trevsbistro. It was filed under Chicago, Restaurant Review .